This individual Report Account Acquisition Strategies: Profitability Drivers and Market Analysis is available for purchase. This Report is available to members of Mercator Advisory Group’s Credit Advisory Service. Please be advised that this Report is normally part of a research and advisory service that provides ongoing support throughout the year. As such, this Report contains significant depth of content that is selected for its strategic importance to our members. (For a description of these services, see our Advisory Services section). Allocation of resources and determining best possible way to get the highest return is a challenging problem in the B2C marketing environment. Credit card marketing is no exception. Issues such as the DNC Registry, decreasing response rates in direct mail, and growing concerns about unsolicited email are eroding effectiveness of these channels making this picture more challenging. 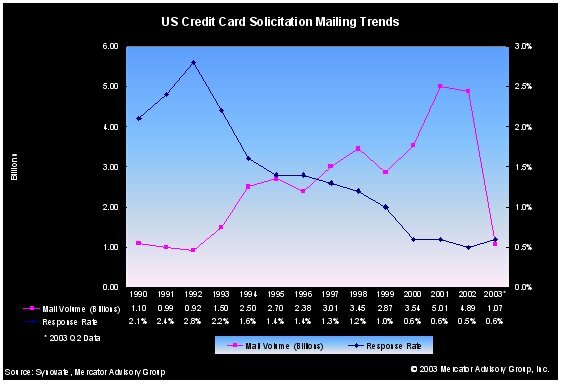 This new research report by Mercator Advisory Group takes a closer look and examines the credit card industry with a focus on the account acquisition strategies. Included in the report is a comparison of domestic media spends for selected top tier firms, which are placing a significant emphasis on brand building. Evren Bayri, Director of Credit Advisory Service and author of the report says "...channels such as email, internet, and event marketing will hold a higher percentage in the marketing mix and represent a substantial area of investment for issuers as DNC Registry enforcement takes effect". Despite industry consolidation led by the top ten firms, the credit card industry remains highly competitive. In an economy coming out of recession, where personal bankruptcies are at record high levels, issuers can sustain growth by incorporating new technologies into their marketing processes. Marketing Optimization solutions such as those from Fair Isaac and Marketswitch address the challenges of B2C marketing environment, and exploit the existing value in marketing campaigns. Using these solutions issuers can achieve 10-30% increase in campaign profitability. This report is 23 pages long and contains 10 exhibits.